Hanoi Impex Pvt. ltd. - Iron & Steel Manufacturing Process by use of Sponge Iron Crude Steel To Finished Steel In the Continuous Steel Casting process, liquid steel is directly cast into semi-finished products, which eliminates the need for primary rolling of ingots. The crude steel or liquid steel is poured into a reciprocating refractory-lined receptacle, called a Tundish. Below the Tundish are water-cooled copper moulds of desired size. The steel solidified in the moulds is slowly pulled out to produce an "endless" strand, which is gas-cut to desired lengths. This steel is called semi-finished steel. The semi-finished steel is fed in to re-rolling mills to get finished steel products.Finished steel products are classified in to two types:1. Finished Carbon SteelAs per the International Iron & Steel Institute (IISI), Finished Carbon steel is defined as steel that has properties made up mostly of the element carbon, and which relies on the carbon content for structure.Finished Carbon steel can be further classified in to three types:a) Long productsb) Flat products andc) Other carbon steel products.Long products are Bars, rods, channels, angles and other structural materials. They are used in the construction and engineering industry and, to some extent, in the manufacturing sector.Flat products consist mainly of sheets, coils and plates. They may be hot-rolled, cold-rolled or galvanized and find use mainly in automobile, shipbuilding and the white goods/consumer durables sectors. 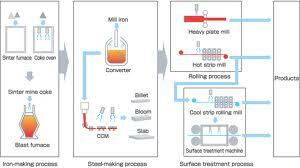 In the Continuous Steel Casting process, liquid steel is directly cast into semi-finished products, which eliminates the need for primary rolling of ingots. The crude steel or liquid steel is poured into a reciprocating refractory-lined receptacle, called a Tundish. Below the Tundish are water-cooled copper moulds of desired size. The steel solidified in the moulds is slowly pulled out to produce an "endless" strand, which is gas-cut to desired lengths. This steel is called semi-finished steel. The semi-finished steel is fed in to re-rolling mills to get finished steel products. As per the International Iron & Steel Institute (IISI), Finished Carbon steel is defined as steel that has properties made up mostly of the element carbon, and which relies on the carbon content for structure. c) Other carbon steel products. Long products are Bars, rods, channels, angles and other structural materials. They are used in the construction and engineering industry and, to some extent, in the manufacturing sector. Flat products consist mainly of sheets, coils and plates. They may be hot-rolled, cold-rolled or galvanized and find use mainly in automobile, shipbuilding and the white goods/consumer durables sectors. Copyright 2010 STEEL PLATE. All rights reserved.